Samsung just recently released a new piece of kit, ATIV Book 9 plus. Its their top of the line Ultrabook. Being in on the market for a new laptop, when I heard of the specs, I was hooked. Sure it doesn't have the best CPU in a laptop or even amazing amount of ram, in that regard its kind of run of the mill. But that was enough for me. The really amazing thing is the screen, with 3200x1800 resolution and 275DPI. If you were to get a stand alone monitor with similar resolution you'd be forking over anywhere from 50-200% the value of the ATIV Book 9 Plus. Anyway this is not a marketing pitch. As a GNU / Linux user, buying bleeding edge hardware can be a bit intimidating. The problem is that it's not clear if the hardware will work without too much fuss. I couldn't find any reports or folks running GNU / Linux on it, but decided to order one anyway. My distro of choice is Debian GNU / Linux. So when the machine arrived the first thing I did was, try Debian Live. It did get some tinkering of BIOS (press f2 on boot to enter config) to get it to boot. Mostly because the BIOS UI is horrendus. In the end disabling secure boot was pretty much all it took. Out of the box, most things worked, exception being Wi-Fi and brightness control. At this point I was more or less convinced that getting GNU / Linux running on it would not be too hard. I proceeded to installing Debian from stable net-boot cd. At first with UEFI enabled but secure boot disabled, installation went over fine but when it came time to boot the machine, it would simply not work. Looked like boot loader wasn't starting properly. I didn't care too much about UEFI so I disabled it completely and re-installed Debian. This time things worked and Debian Stable booted up. I tweaked /etc/apt/sources.list switching from Stable to Testing. Rebooted the machine and noticed that on boot the screen went black. It was rather obvious that the problem was with KMS. Likely the root of the problem was the new kernel (linux-image-3.10-3-amd64) which got pulled in during upgrade to testing. The short term work around is simple, disable KMS (add nomodeset to kernel boot line in grub). So now I had a booting base system but there was still the problem of Wi-Fi and KMS. I installed latest firmware- iwlwifi which had the required firmware for Intel Corporation Wireless 7260. However Wi-Fi still did not work, fortunately I came across this post on arch linux wiki which states that the Wi-Fi card is only supported in Linux Kernel >=3.11. So if you are looking to get Samsung ATIV Book 9 and wondering if it'll play nice with GNU / Linux. The answer is yes. I got myself one of the fancy shmancy netbooks. Due to a habit and some hardware issues I needed to compile a kernel. The problem here though is that it takes for ever to build a kernel on one of these things. No sweat I'll just build it on my desktop, it'll only take 5-10 minutes. But of course there is a catch. My desktop is 64bit and this new machine is an Atom CPU which only does 32bit. The process for compiling a 32bit kernel on a 64bit machine is probably a lot easier if you don't compile it the Debian way. But this is not something I want to do, I like installing the kernels through the package manager and doing this type of cross compile using make-kpkg is not trivial. There are plenty of forum and email threads about people recommending to use chroot or virtual machines for this task, but that is such a chore to set up. So here is my recipe for cross compiling 32bit kernel on 64bit host without chroot / vm, the-debian-way. That's it, now just transfer the re-generated deb to destination machine and install it. Many if not all ideas for this process come from reading email threads the comments made by Goswin Von Brederlow were particularly helpful, thanks. Every six months the internet lights up with stories that Canonical & Co has done the unthinkable they have increased the number following the word Ubuntu. In other words they have release a new version. This is a well understood concept to differentiate releases of software. As the version increases it is expected that new features are introduced and old bugs are removed (hopefully more are removed than added). Versioning distributions and releasing the versions separately is a common practice, employed by most if not all distributions out there. Ubuntu has adopted the policy of releasing regularly and quite often. But there is a different approach it revolves around a concept I call "Versionless" where you do not have a hard release but instead let the changes trickle down. In the application world these releases are often called nightly builds. With distributions it is a little bit different. First of all its worth noting that distributions are not like applications. Distributions are collection made up by applications and a kernel, the applications that are included are usually stable releases and so the biggest unpredictability comes from the combination and configuration there of. As a result one of the important roles for distro developers is to ensure that the combination of the many applications does not lead to adverse side effects. This is done in several ways, the general method is to mix all the applications in a pot, the so called pre-release and then test the combination. The testing is done by whole community, as users often install these pre-releases to see if they see any quirks through their regular use. When the pre-release becomes stable enough it is pushed out the door as a public release. In an ideal world after this whole process all the major bugs and issues would have been resolved and users go on to re-install/update their distribution installations to the new release -- without any issues. The problem is that even if the tests passed with flying colors does not mean that on the user will not experience problems. The more complicated a configuration that a user has the more chances they will notice bugs as part of upgrade. This is particularly evident where there are multiple interacting systems. Doing a full upgrade of a distribution it is not always obvious what change in the update has caused this problem. Versionless distributions are nothing new, they has been a staple of Debian for a while. In fact it is the process for testing package compatibility between release, but it is also a lot more. There are two Debian releases that follow this paradigm, Debian Testing and Debian Unstable. As applications are packaged they are added to Debian Unstable and after they fulfill certain criteria, IE they have spent some time in Unstable and have not had any critical bugs filed against them, they are then passed along to Debian Testing. Users are able to balance their needs between new features and stability by selecting the corresponding repository. As soon as the packages are added to the repositories the become immediately available to user for install/upgrade. What it really comes down to is testing outside your environment is useful but it cannot be relied solely upon. And when upgrades are performed it is important to know what has changed and how to undo it. Keeping track of changes for 1000's of updates is nearly impossible. So update small and update often, use Debian. Good packages managers are your best friend, but only second to great package developers! Apparently Linux does not have any monitor hotplugging support which is quite a pain. Every time you want to attach a monitor to laptop you have to reconfigure the display layout. This is a tad frustrating if you have to do this several times a day. And it doesn't help that KDE subsystems are a bit flaky when it comes to changing display configuration. I've had plasma crash a on me 1/3 times while performing this operation. You probably need to adjust the xrandr line to make it behave like you want but auto everything works quite well for me. Check man page for xrandr for details. For further reading on monitor hot plugging I encourage you read launchpad bug #306735. Fortunately there are solutions for this problem, however they are on the other side of the pond. Update: Added the kwin replace line to fix sporadic malfunction of kwin (disappearance of window decorations) during this whole operation. Flash is an absolute resource drain you've probably noticed how it completely hogs resources when you watch a video. Ever wonder how much more power is consumed watching flash over a regular video file? Is it a significant number? For those too lazy to read the rest, the simple answer is yes. And now to the details. Recently I was watching a hulu video on a 1080P monitor and I noticed it was a little choppy. I decided to conduct an experiment and actually measure the difference in resource, power utilization between flash and h.264 (in mplayer). Not having the desire to make a video and encode it for flash and h.264 I randomly chose a trailer which was sufficiently long and was widely available in multiple formats. Tron Legacy, conveniently available through youtube and The Pirate Bay in 1080P, excellent. In a more or less idle state my laptop draws around 1500mA of current (according to ACPI), CPU utilization is around 3% and clock averaged both cores is somewhere around 1.5Ghz (1Ghz min 2Ghz max .25Ghz step size utilizing the on-demand CPU frequency governor). Firing up the video through youtube in windowed mode (which scales the video to around 800pixels) The CPU utilization jumps up to around 85% and current draw to around 44000mA clock is continually kept at 2Ghz on both cores. Setting the movie to full screen (1080 pixels wide) decreases CPU usage to 70% and current draw to 3500mA, this might sound counter intuitive but it makes perfect sense as at 1920 wide the video is in native resolution and does not need to be scaled (This actually demonstrates that Flash does not make good use of the hardware scaling AKA Xv). Viewing the same 1080p trailer in mplayer, does reduce CPU load and current draw. Size of the video window does not matter much scaling it to about 800pixels or viewing in native 1920 pixels wide results in same numbers, thanks to mplayers Xv support. CPU utilization is around 40% and CPU does quite frequently clock down to reduce power consumption, current draw is around 3000mA. So what does all of this mean. Assuming the voltage at the built in ACPI ammeter is equal to battery voltage (11.1V) that means the difference in power consumption between playing a video in flash vs Mplayer h.264 is about equivalent to medium strength CFL light bulb (1.5A*11.1V=15watts). Now this experiment is completely unscientific and has many flaws, primarily perhaps that I use Linux 64 bit flash player (10,0,42,34) the vast majority of flash users are obviously on windows and its possible that it runs better on windows platforms but I wouldn't bet money on that. It makes me wonder if google is supposedly so concerned about being green maybe they should think about switching the default video format for youtube. We can do some interesting estimations. Lets assume that the average user of youtube watches 10 minutes worth of content in the default flash format, that means they consume about ( 10hours * 15watts / 60 minutes in an hour * 52 weeks in a year / 1000 watt hours in megawatt hours) .13 kilowatt hours per year more than using other formats. This does not sound like all that much but, assuming that 5% of the world population fits into this category it equals to about 40 000 000 kilowatts of power that could be saved. What does this number really mean? I invite you to go to the EPA Greenhouse calculator and plug it in. You'll see its equivalent to annual emission of 5500 cars. Again the numbers are completely unscientific but even if they are off by a factor of 3, it is still a significant number. It would be nice for someone to conduct a more thorough investigation. While conducting this experiment I noticed something interesting. Playing the 1080p video in youtube would work fine for the first 1.5 min but then it would get choppy. The full trailer was fully downloaded so it didn't make much sense. Firing up KDE System monitor I was able to quite quickly to figure out the problem. 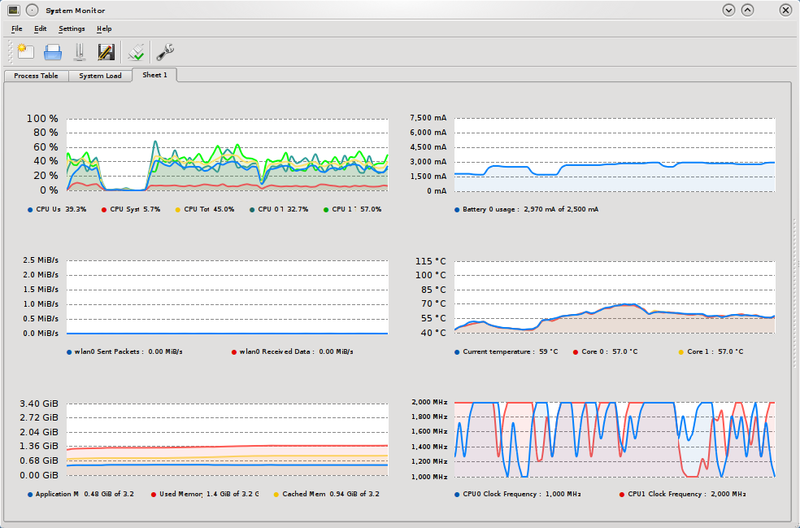 As the video got choppy the CPU clock would drop while usage remained high, clearly the problem must be with cooling. 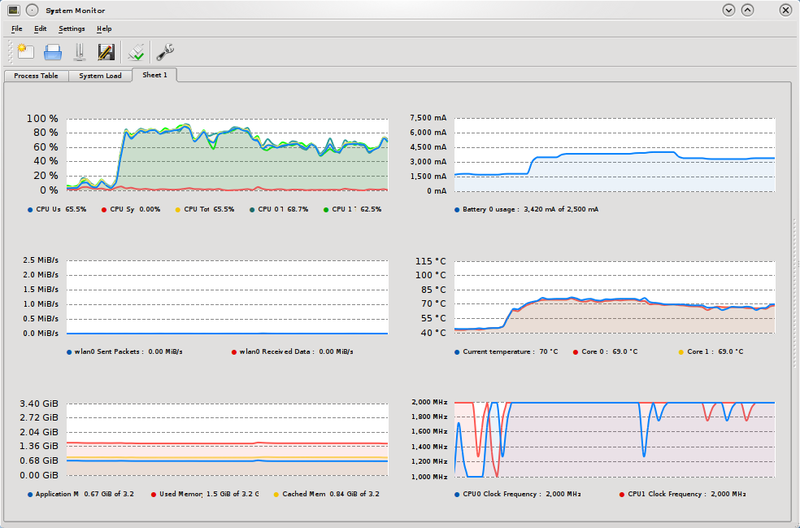 System monitor was reporting CPU temperature of about 100C and power consumption of almost 6000mA. It had been a while since I cleaned the inside of my laptop, so I stripped it apart and took out a nice chunk of dust that was between the radiator and the fan. After this CPU temperature never went above 85C and current draw was at a much more reasonable 4400 while playing the flash video. Hopefully this will resolve my choppy hulu problem. The graphs of this experiment are available. The flash graph, at first the scale trailer was played following by full screen. For the mplayer graph the inverse was done, first full screen then scaled .. but it doesn't matter much for mplayer. En guarde? La ou est le salut? In reply to Josef "Jeff" Sipeks reply to my post entitle SMTP -- time to chuck it from a couple of years ago. This is a (long overdue) reply to Ilya's post: SMPT -- Time to chuck it. There are two apparent problems at the root of the SMTP protocol which allow for easy manipulation: lack of authentication and sender validation, and lack of user interaction. It would not be difficult to design a more flexible protocol which would allow for us to enjoy the functionality that we are familiar with all the while address some, if not all of the problems within SMTP. To allow for greater flexibility in the protocol, it would first be broken from a server-server model into a client-server model. That is, traditionally when one would send mail, it would be sent to a local SMTP server which would then relay the message onto the next server until the email reached its destination. This approach allowed for email caching and delayed-send (when a (receiving) mail server was off-line for hours (or even days) on end, messages could still trickle through as the sending server would try to periodically resend the messages.) Todays mail servers have very high up times and many are redundant so caching email for delayed delivery is not very important. "Delayed delivery is not very important"?! What? What happened to the whole "better late than never" idiom? It does little to no good if the network connection is flakey. Ilya is arguing that that's rarely the case, and while I must agree that it isn't as bad as it used to be back in the 80's, I also know from experience that networks are very fragile and it doesn't take much to break them. A couple of times over the past few years, I noticed that my ISP's routing tables got screwed up. Within two hours of such a screwup, things returned to normal, but that's 2 hours of "downtime." Another instance of a network going haywire: one day, at Stony Brook University, the internet connection stopped working. Apparently, a compromised machine on the university campus caused a campus edge device to become overwhelmed. This eventually lead to a complete failure of the device. It took almost a day until the compromised machine got disconnected, the failed device reset, and the backlog of all the traffic on both sides of the router settled down. Failures happen. Network failures happen frequently. More frequently that I would like them to, more frequently than the network admins would like them to. Failures happen near the user, far away from the user. One can hope that dynamic routing tables keep the internet as a whole functioning, but even those can fail. Want an example? Sure. Not that long ago, the well know video repository YouTube disappeared off the face of the Earth...well, to some degree. As this RIPE NCC RIS case study shows, on February 24, 2008, Pakistan Telecom decided to announce BGP routes for YouTube's IP range. The result was, that if you tried to access any of YouTube's servers on the 208.65.152.0/22 subnet, your packets were directed to Pakistan. For about an hour and twenty minutes that was the case. Then YouTube started announcing more granular subnets, diverting some of the traffic back to itself. Eleven minutes later, YouTube announced even more granular subnets, diverting large bulk of the traffic back to itself. Few dozen minutes later, PCCW Global (Pakistan Telecom's provider responsible for forwarding the "offending" BGP announcements to the rest of the world) stopped forwarding the incorrect routing information. So, networks are fragile, which is why having an email transfer protocol that allows for retransmission a good idea. Pas touche! I have not conducted extensive surveys of mail server configurations, but, from personal experience; most mail server give up on sending email a lot sooner than recommended. RFC 2821 calls for a 4-5 day period. This is a reflection of the times, email is expected to deliver messages almost instantaneously (Just ask Ted Stevens!). As you are well aware I am not implying that networks are anywhere near perfect, it just does not matter. If you send a message and it does not get delivered immediately your mail client would be able to tell you so. This allows you to reacts, had the message been urgent you can use other forms of communication to try to get it through (phone ). The client can also queue the message (assuming no CAPTCHA system, more on that later) and try to deliver it later. Granted machines which run clients have significantly shorter uptimes than servers but is it really that big of a deal, especially now that servers give up on delivery just a few hours after first attempt? I, for one, am looking forward to the day when I no longer have to ask my potential recipient whether or not they have received my message. Instead, having direct communication between the sender-client and the receiver-server has many advantages: opens up the possibility for CAPTCHA systems, makes the send-portion of the protocol easier to upgrade, and allows for new functionality in the protocol. Wow. So much to disagree with! What about mailing lists? How does the mailing list server answer the CAPTCHAs? How does eliminating server-to-server communication make the protocol easier to upgrade? New functionality is a nice thing in theory, but what do you want from your mail transfer protocol? I, personally, want it to transfer my email between where I send it from and where it is supposed to be delivered to. If anything eliminating the server-to-server communication would cause the MUAs to be "in charge" of the protocols. This means that at first there would be many competing protocols, until one takes over - not necessarily the better one (Betamax vs. VHS comes to mind). What happens in the case of overzealous firewall admins? What if I really want to send email to bob@example.com, but the firewall (for whatever reason) is blocking all traffic to example.com? Touche! I have to admit CAPTCHAs are a bit ridiculous in this application. By creating more work for admins. It allows users to more directly complain to the admins that the new protocol feature does not work. Yes I know admins want less work and fewer complaining users, but there are benefits. It really comes down to the fact that with more interactivity it is easier to react to changes, servers do not have brains but the people behind their clients do. Hopefully that will still happen. Well the worse protocol is already winning SMTP, dMTP (dot Mail Transfer Protocol) is so much better even if it is quite vague. MUAs will not be in charge, if they don not play ball then mail will not be delivered. And so this brings us to the next point, authentication, how do you know that the email actually did, originate from the sender. This is one of the largest problems with SMTP as it is so easy to fake ones outgoing email address. The white list has to rely on a verifiable and consistent flag in the email. A sample implementation of such a control could work similar to the current hack to the email system, SPF, in which a special entry is made in the DNS entry which says where the mail can originate from. While this approach is quite effective in a sever-server architecture it would not work in a client- server architecture. Part of the protocol could require the sending client to send a cryptographic-hash of the email to his own receiving mail server, so that the receiving party's mail server could verify the authenticity of the source of the email. In essence this creates a 3 way handshake between the senders client, the senders (receiving) mail server and the receiver's mail server. I tend to stay away from making custom authentication protocols. In this scheme, what guarantees you that the client and his "home server" aren't both trying to convince the receiving server that the email is really from whom they say it is? In kerberos, you have a key for each system, and a password for each user. The kerberos server knows it all, and this central authority is why things work. With SSL certificates, you rely on the strength of the crypto used, as well as blind faith in the certificate authority. They might, the point is not so much to authenticate the user but to link him to a server. If the server he is linked to is dirty, well you can blacklist it. Much of the spam today is sent from bot-nets, in this schema all the individual botnet senders would have to link themselves to a server. Obviously, a clever spammer would run a server on each of the zombie machines to auth for itself. The catch is that he would have to ensure that the Firewalls/NATs are open and that there is a (sub-) domain pointing back at the server. This is all costly for the spammer and for the good guy it'll be easy to trace down the dirty domains. Umm...while possible, I believe that very very large majority of email is sent via SMTP (and I'm not even counting all the spam). Carton jaune, I addressed that issue in my original posting which is just 2 sentences below this one. Excessive lobotomy is not appreciated. first email is sent for storage (over IMAP or POP) to the senders mail server and then it is sent over SMTP to the senders email for redirection to the receivers mail server. It is even feasible to implement hooks in the IMAP and POP stacks to talk to the mail sending daemon directly eliminating an additional socket connection by the client. Why would you want to stick with IMAP and POP? They do share certain ideas with SMTP. Carton rouge, I said nothing about sticking to IMAP/POP. The point is that the system can be streamlined somewhat. For legitimate mass mail this process would not encumber the sending procedure as for this case the sending server would be located on the same machine as the senders receiving mail server (which would store the hash for authentication), and they could even be streamlined into one monolithic process. Not necessarily. There are entire businesses that specialize in mailing list maintenance. You pay them, and they give you an account with software that maintains your mailing list. Actually, it's amusing how similar it is to what spammers do. The major difference is that in the legitimate case, the customer supplies their own list of email address to mail. Anyway, my point is, in these cases (and they are more common than you think) the mailing sender is on a different computer than the "from" domain's MX record. I do not think that increasing the burden on mass mailers even good ones is such a bad thing. I really can't help but read that as "If we use this magical protocol that will make things better, things will get better!" Sorry, but unless I see some protocol which would be a good candidate, I will remain sceptical. And I can not help but read this as "We should not think about improving protocols because it impossible to do better." In any case I appreciate your mal-pare. The discussion is important as letting protocols rot is not a good idea. Eric S. Raymond speaks heresy. Recently my local LUG (LILUG) invited Eric S. Raymond (ESR) to come and speak. For those of you who are not familiar with ESR, he is one of the three largest icons of the Open Source/Free Software movement. Needless to say, it was an honor so see him speak. For the most part, his talk was quite tame but one of the points he raised seemed quite controversial. According to him the GPL and other viral licenses are no longer needed as they do more harm than good to the community. I don't want to put words into his mouth so I've transcribed what he said during the talk. You can view the ESR Q/A talk in its entirety, this specific excerpt is about 45 minutes into the video. What is the point of being famous and respected if you can't speak heresy about your own movement. What is the point? One of my heretical opinions is that we worry way too much about licensing. And in particular; I don't think we really need reciprocal licensing. I don't think we need licenses like the GPL, that punish people for taking code closed-source. Let me explain what I think. And then I'll explain [why] the fact we don't actually need those [licenses] matters. I don't think we need them because. There has been a fair amount of economic analysis done in the last 10 years, significant amount of it has been done by, well, me. Which seems to demonstrate that open source is what the economist call a more efficient mode of production use, superior mode of production. You get better investment, better return out of the resources you invested by doing open source development than closed source development. In particular, there have been a number of occasions on which people have taken open source products that were reasonable successful, and just taken them closed. Effectively putting them under proprietary control, proprietary licensing and then tried to make a business model out of that. They generally fail. And the reason they fail is pretty simple. That is because when you take a product closed, you are now limited to what ever small number of developers that your corporation can afford to hire. The open source community that you just turned your back on does not, they have more people than you. They can put out releases more frequently, getting more user feedback. So the suggestion is, simply because of the numerical dynamics of the process: taking open software closed is something that the market is going to punish. You are going to lose. The inefficiencies inherent in closed source development are eventually going to ambush you, going to [inaudible] you, and your are not going to have a business model or product anymore. We've seen this happened number of times. But now, lets look at the implications of taking this seriously. The question I found myself asking is: if the market punished people for taking open source closed, then why do our licenses need to punish people for taking open source closed? That is why I don't think you really need GPL or a reciprocal licenses anymore. It is attempting to prevent the behavior that the market punishes anyway. That attempt has a downside, the downside is that people, especially lawyers, especially corporate bosses look at the GPL and experience fear. Fear that all of their corporate secrets, business knowledge, and special sauce will suddenly be everted to the outside world by some inadvertent slip by some internal code. I think that fear is now costing us more than the threat of [inaudible]. And that is why I don't we need the GPL anymore. Eric then went on to say that the BSD license is a good alternative to the GPL. This has sparked a heated discussion on the Free Software Round Table (FSRT) radio shows mailing list. While one can admire of the simplicity and clarity of the license it seems far fetched to say that it should be replacing the GPL. While yes there are economical incentive for corporations to keep code Open Source but the relative cost of closing the source depends largely on the size of company. Yes some small companies will not be able to afford to keep a code base alive with internal/contracted developers for larger companies the costs are a lot easier to digest. Prime example of such a large company is Apple. In 2001 Apple came out with a completely new version of its operating system, MAC OS X. Although a successor to MAC OS 9, it was very different. OS X borrowed a very large code base from the BSDs, and some (pretty much everything but Darwin) of the code was effectively closed. This has not prevented Apple or OS X from thriving. From the other end of the spectrum, are the companies such as MySQL AB which produce Free Software but also sell closed source licenses of the same code for a 'living.' There is a market for this, it exists because of those scared lawyers and corporate bosses. Killing the GPL would effectively kill this market, as a result development on some of these projects would slow down significantly. The Open Source/Free Software movement is thriving, it does not mean its a good time to kill the GPL. In fact I don't think there will ever be a time when killing the GPL will do more good than harm. You need to adjust the last line to the aspect ratio of your screen. As a side effect all videos (even in windowed mode) will have the black bars added to them to pad them out to the aspect ratio, its a small price to pay. I've gotten into a photo mood lately. Both shooting editing and organizing. With it I've discovered some new useful tools as well gotten to know the ones I've used before better. Save export options of raw images along with raw image. better support for raw images (does not scale raw on upload). Automatically fill out gallery title and description using local info. Ability to preview pictures on select. Most of these issues are not major, especially since some of these will be solved with the multi-root support of the KDE4 release. I started with the negatives but it has a lot of cool features also. One of my favorite is calendar view. Regardless of how your galleries are organized it will use the EXIF date tag to arrange all your photos by date. It really helps when organizing photos. Tagging is also very useful, you can tag any photo and then you can view all photos by particular tag really make it easy to organize data. DigiKam also has a slew of semi-functional export features such as gallery2, flickr, and picasa. These are provided through the kipi framework, they are nice but most require some more work to become completely feature- full and userfriendly. Almost forgot, digiKam is also an excellent tool for downloading photos from cameras. Most cameras are not plain UMS devices so they need special software to fetch the pictures out of them. If you are on windows you can usually use the manufacturer software to do this, but on Linux this is a tad complicated. Unless of course you use digiKam -- which turns the process into a magic "detect [the camera type] and download" single click operation. To share my photos with the world I use a web based photo-manager as a front- end to my local database. Its called gallery. I have tried this tool in the past and it was just too cumbersome to use (I ended up writing my own PHP gallery system). But with the kipi export plug-in to digiKam and the remote plug in to gallery life just become easy. So that's it for now, shoot away. And if you like, you can check out my public gallery.